If you want to average, count, sum or perform any other statistic on values in SQL, you need to learn the GROUP BY and HAVING parts of a SQL statement. That's where this online tutorial comes in! This blog is part of our much longer full SQL tutorial (although we also run training courses in SQL, for up to 6 people at a time). There are a few ways that you can tweak the results of a grouping command in T-SQL - as listed below! The query lists the number of films made for each combination of director and studio. The start of the output from the above query. You can see a grand total, a total for each director and then the total for each director/studio combination. The above query counts the number of films for each director, but not for each studio. To show both subtotals yoiu can use the CUBE operator. You can even specify for exactly which columns you want to agggregate data. The CUBE operator replaces the WITH CUBE keywords (which are now no longer supported). I confess that I can't see the point of using WITH ROLLUP instead oF using CUBE, but I've left it in this blog just in case I'm missing the point! The grand total is shown first, then each of the director totals. (d.DirectorName,s.StudioName) Director and studio combination. () Nothing (just returns a single figure). Using grouping sets like this allows you to avoid using the UNION operator to combine results from several different queries. 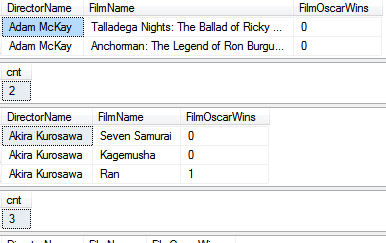 The first couple of output sets for this query. Each one shows the total number of rows returned for that director. A limitation of COMPUTE is that the query must order the results by the same field that you then compute by. Quite why you would ever use this I don't know; I've included it for the sake of completeness!